Eugene "Gene" Goldsmith is a native New Yorker who has proudly called Tucson home for over 30 years. Gene received graduate and law degrees from the University of Arizona and has been an Arizona trial lawyer for 25 years. 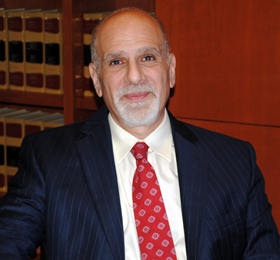 Gene maintains a general commercial and tort litigation practice that focuses on complex litigation and working with his clients to identify problems and find solutions. Gene's practice has included partnership and shareholder disputes, securities fraud, wrongful death, personal injury, insurance coverage, contract, defamation, commercial disparagement, real estate, wrongful discharge, discrimination, class actions, quiet title and bad faith. Gene was formerly a Judicial Law Clerk to the Honorable James D. Hathaway, Arizona Court of Appeals, Division 2, and a shareholder and associate at the Tucson law firm of Miller, Pitt & McAnally, P.C (currently Haralson, Miller, Pitt, Feldman & McAnally, P.L.C). Before going to law school, Gene spent four years as a teacher in Nogales, Arizona, serving as a special education resource teacher and supervising classrooms for learning disabled and developmentally disabled high school and junior high school students. Gene continues his passion for helping others through his service as a Board Member and Trustee of the Beacon Group. The Beacon Group provides vocational and community living experiences for developmentally disabled adults, including a sheltered workshop, community job placements and a day activity program. We're dedicated to serving clients in Tucson and throughout Southern Arizona. There is never a charge for initial consultation. To speak with a McNamara Goldsmith attorney, call 520-624-0126.